Shazam! is a half-hour live-action television program produced by Filmation (the animation studio’s first such program), based upon DC Comics’ superhero Captain Marvel. The show ran from 1974 to 1977 on CBS; from 1975 to 1977 it was known as The Shazam!/Isis Hour, and included The Secrets of Isis, about an Ancient Egyptian superheroine resurrected in the body of a schoolteacher, as the second half of the hour. Shazam! was brought back for reruns in 1980. 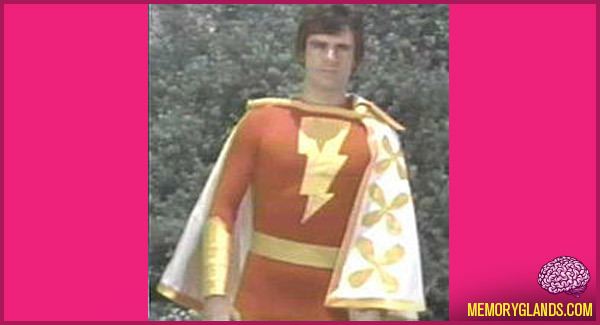 Actor Michael Gray stars as young Billy Batson, while Captain Marvel was played first by Jackson Bostwick, and later by John Davey. Actress Joanna Cameron appeared as Isis, and her alter-ego Andrea Thomas, on three episodes of Shazam!, and Davey likewise appeared as Captain Marvel in three episodes of Isis.